To have watched the Amiri label grow from a small rack in Maxfields LA to now having a permanent showroom in Paris on Avenue Montaigne in just 5 short years is astounding, to say the least. Following up a colorful S/S 19 collection, the latest offering from Amiri turns back to the darker aesthetic under which they initially launched from in late 2014. 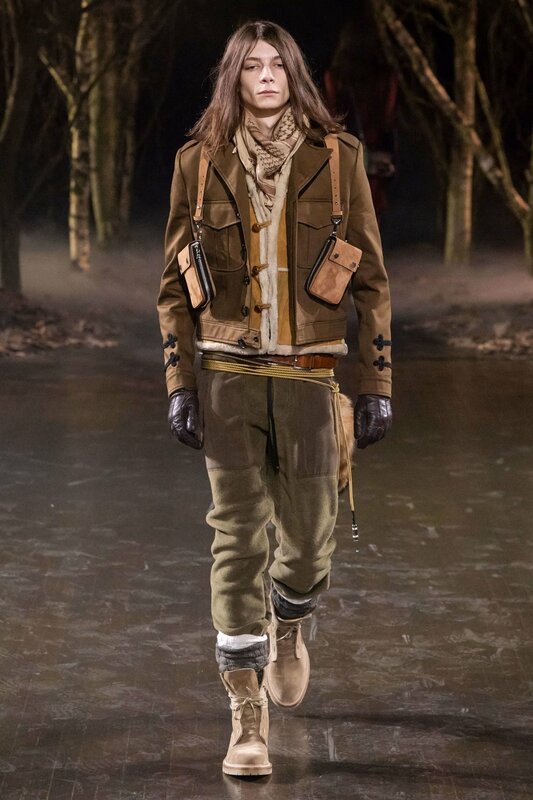 The collection overall seemed to reference similar styles from Decarnin's legendary F/W 11 collection for Balmain, which featured similar short pea coats, woolen socks paired with lace-up boots, and the variety of earth tones throughout. With that being said, Amiri fine-tuned those references and added their own perspective with strong attention to detail. Out of the last 3 seasons in which Amiri has presented a runway presentation in Paris, I would say this collection is without a doubt the most luxury and refined offering from the LA-based label. Every detail from the Swarovski inlaid guitar straps, the auxiliary plug drawstrings, as well as the introduction of belted & harness leather bags, took the Amiri label to new heights of luxury. The highlights of the collection were the cashmere guitar strap overcoats, the snakeskin boots, the music note stitched bomber, the multi patched jeans, and the harness bags. Be sure to swipe through our favorite looks from the collection below.